JUNIOR ACHIVEMENT - Inspire And Prepare Young People To Succeed. •	JA BizTown teaches students how to operate companies, manage finances, and vote for mayor in a simulated town. •	JA Economics, a course for older students, explores how economic principles influence business decisions and consumer behaviors. •	JA Finance Park introduces students to personal budgeting by assigning them careers, families, mortgages, and other responsibilities, including developing a personal budget. •	JA Global Marketplace teaches students how globalization affects their lives as they take on the role of business owners who produce globally sourced goods. •	JA Innovation Camp presents older students with a hypothetical social or business challenge and gives them the tools to find innovative solutions to the challenge in one day. •	JA Our City explores the impact of city government, financial institutions, and the media on small businesses and startups. 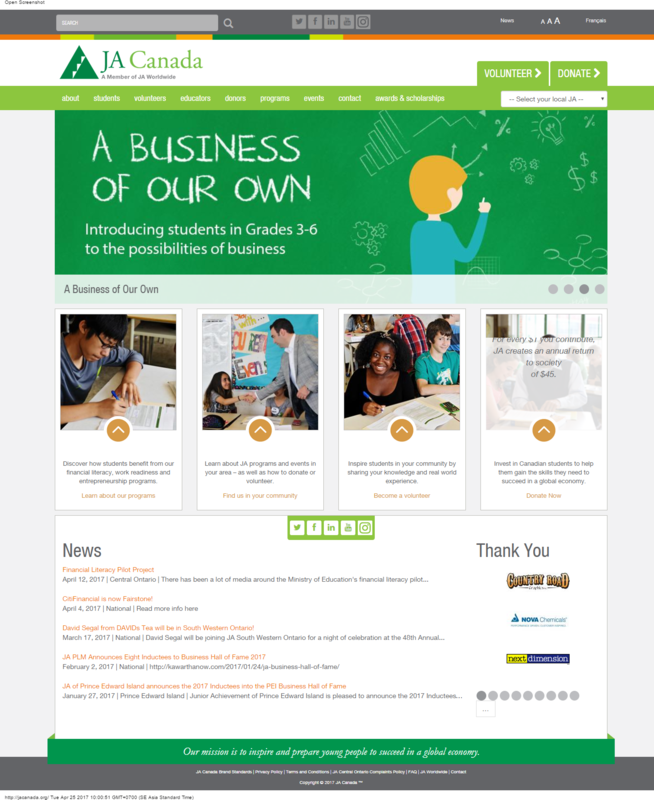 •	JA Our Community teaches students about the intersection of business and community, especially how money flows through an economy. •	JA Our Families explores how the work of family members contributes to the well-being of the family and the larger community. 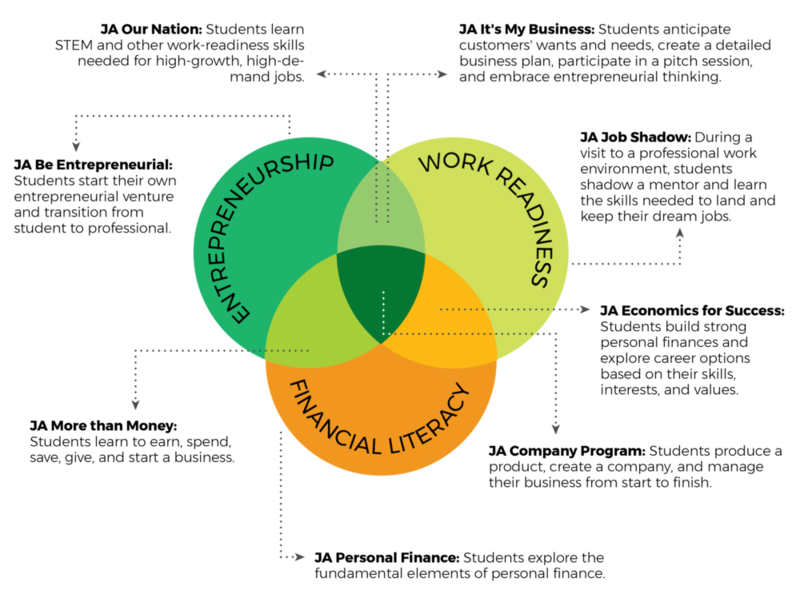 •	JA Our Region gives students a first look at entrepreneurship as they run a hypothetical business and track revenue and expenses. 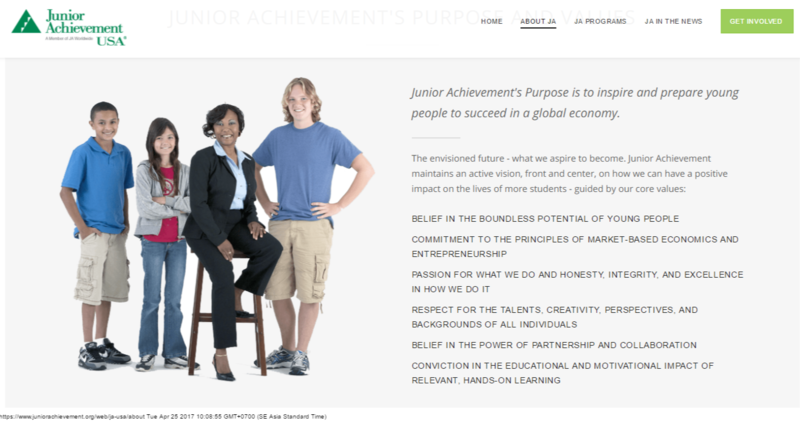 •	JA Ourselves introduces young students to the role they play in an economy, including the importance of saving and giving and the value of work. •	JA Success Skills focuses on communication, collaboration, learnability, technological fluidity, and other interpersonal skills that lead to success in the workforce. •	JA Travel & Tourism Biz, also called TTBiz, helps students move easily among cultures and encourages them to start tourism-related businesses. To commemorate our 100th year in 2019, we've launched 100 Lives: profiles of JA alumni who are making a difference across the globe. Watch their inspiring journeys. Our staff serving more than ten million young entrepreneurs in more than 100 countries..